I love this stuff! 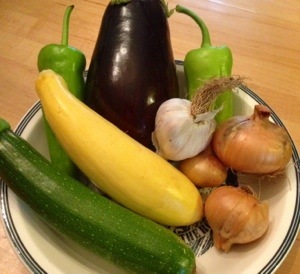 Yet another stop at the local farm stand last weekend, this time culminating in my version of a ratatouille. 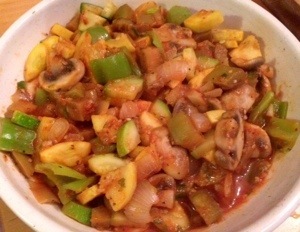 This recipe can really be made with whatever vegetables you like, in any proportion you like, but here’s how I made it. 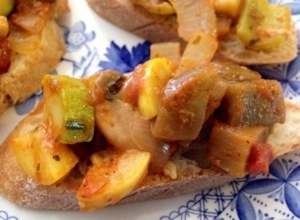 I generally serve this as a side dish, but it’s great as an hors d’oeuvre or as a bruschetta topping for a quick healthy snack. 2 tsp Italian herb mix, or about 1/2 tsp each of dried oregano, basil, thyme, parsley, and rosemary (as desired), or 1 tsp each if using fresh. Peel the eggplant and chop into cubes (about 1/2″). 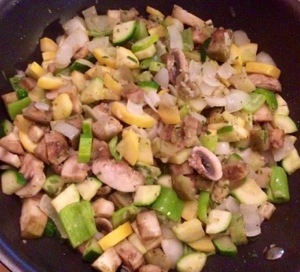 Quarter the zucchini and yellow squash lengthwise and chop into 1/4″ slices. Chop the pepper and onion into a medium dice. Finely chop the garlic or push through a garlic press. Add all these ingredients to a large skillet with the butter and olive oil. Saute for a couple minutes. Add the herbs, black pepper, and salt if desired. Saute for just another 2-3 minutes or so – I don’t like the vegetables to get too soft. Add the tomato sauce slowly and see how the proportions look. I don’t like a lot of extra sauce in this dish, so I use just enough to coat everything. You could add a lot more if you wanted to, though. Let it simmer for a couple minutes and you’re good to go! 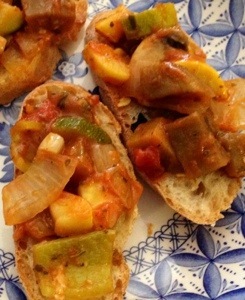 This entry was posted in Dinner, hors d'oeuvres, Italian, Side dishes, Vegetables and tagged bruschetta, eggplant, garlic, italian, mushroom, Onion, pepper, Ratatouille, squash, Tomato sauce, zucchini. Bookmark the permalink.